Would you like a brighter smile? The are many reasons our teeth can look a little darker. Many of the foods we eat can cause our teeth to stain. Smoking and some medications can also affect the colour of our teeth. When this staining builds up within our teeth, it becomes impossible to remove with brushing alone. We can restore the brightness of your teeth with a simple and convenient course of home tooth whitening, allowing you to smile with confidence. Following an examination to ensure your teeth and gums are healthy, we take moulds of your teeth to make custom fitting whitening trays. Once the fit of these trays has been checked, we guide you through the use of the whitening gel ensuring you are completely happy with the process. The whitening can be carried out conveniently around your lifestyle, in the comfort of your own home. We recommend wearing the trays for a few hours (or through the night if you prefer) every other day. You should start to see improvements within a few sessions, but most people will complete the course over 3-4 weeks. As the change is gradual, you can stop the whitening whenever you feel your teeth have reached the desired shade. Your smile may need a ‘top-up’ in the future, so as long as you keep your custom whitening trays safe, extra whitening gel can be purchased at the practice whenever your smile needs a boost. Tooth whitening is generally suitable for most patients however the colour of any existing restorations such as fillings, crowns or veneers will not change. Often these can be changed following a course of tooth whitening to match the colour of your teeth. Tooth whitening is an extremely safe procedure, as long as it is provided by a qualified and experienced dental professional. There are many unqualified people that are providing tooth whitening illegally, putting patients safety at risk. 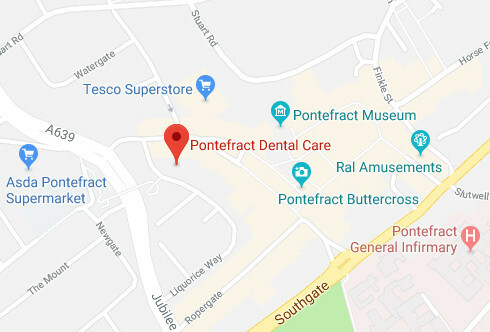 At Pontefract Dental Care, we provide tooth whitening that is safe and comfortable and our experienced team is always on hand to provide aftercare.